The Florida Office of Greenways & Trails joined Jackson County officials in celebrating the Upper Chipola River Paddling Trail as the latest addition to the Florida’s Greenways & Trails System. Local and state officials gathered riverside on Friday, December 12 at Christoff Landing near Marianna. As part of the ceremony, representatives from the Florida Paddling Trails Association recognized Jackson County as an official “Blueways Community.” Afterwards, paddlers experienced the new trail by paddling to Florida Caverns State Park. As Florida’s 51st designated paddling trail, this upper portion of the Chipola River begins at Christoff Landing, managed by the Northwest Florida Water Management District. A convenient primitive group campground is nearby. Home to abundant wildlife and excellent fishing, the river meanders about 4.5 miles through floodplain forests, past crystal-clear springs, and ends at the boat ramp within Florida Caverns State Park. Log jams in the river have been adequately cleared by Jackson County and state park staff to allow small fishing boats, canoes and kayaks to safely navigate the waters. It may also be possible (depending on water levels and downed trees), to paddle upstream to the historic Bellamy Bridge, the scene of colorful ghost legends. Jackson County is home to a wealth of excellent boating, fishing and paddling waterways within a region of great biodiversity and outstanding wildlife habitat. In other paddling trail news, The Lake County Blueway System was also added to the Florida Greenways and Trails System at the December meeting of the Florida Greenways and Trails Council. Also, the Apalachicola Blueway was recently added as a featured trail on the American Trails' National Recreation Trails website. The Office of Greenways & Trails, with assistance from other Department staff and the Florida Greenways and Trails Council, has embarked on a long-term project to develop travel itineraries throughout the state. The idea is to show the trails and points-of-interest available within a 15 miles radius of select state parks, towns and other sites. Several itineraries in the Florida Panhandle along with the town of White Springs in north-central Florida have thus far been completed and posted on the OGT website. Another related project will feature an itinerary of historic Florida attractions that are now state parks--Wakulla Springs, De Leon Springs, Silver Springs, Rainbow Springs, Weeki Wachee Springs and Homosassa Springs. So, stay tuned for more news in the future about the "Wish You Were Here" project. Winter is a perfect time for hiking in Florida, and with more than 2,500 miles of hiking trails on public lands, numerous options can be found in every region of the state. That’s why February is recognized as Florida Hiking Trails Month. 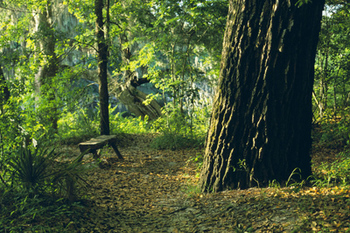 Most Florida state parks feature hiking trails and several offer ranger-led interpretive hikes on weekends. These range from the rolling hills and bluffs of Torreya State Park in the Panhandle to the swampy environs of southwest Florida’s Fakahatchee Strand. Check out the events page on the Florida State Parks website for a hike near you. Florida is also home to one of 11 congressionally-designated National Scenic Trails in the United States. The 1,300-mile Florida National Scenic Trail stretches from the Big Cypress National Preserve to Fort Pickens near Pensacola. The trail showcases many of Florida’s diverse ecosystems and can easily be broken up into shorter day or weekend hikes. Many of these shorter hikes are described as “Grab and Go Hikes” on the Florida Trail Association website, complete with maps and directions. Hiking events are also listed on the same page. Also on the Florida Trail Association website is a section called “Other Trails,” featuring trails throughout the state that are not along the main corridor of the national scenic trail. Another website that features comprehensive statewide hiking information is Florida Hikes!. So, what are you waiting for? Limber up those legs, grab a pack and get going! The previous edition of the Connections Newsletter contained an overview of the Coast to Coast Connector (C2C or Connector) Summit. The Summit was considered to be a major success and all meeting materials have been posted online, including meeting summaries, maps, presentations and reports. In 2015, the Office of Greenways & Trails expects to publish an update on the 2013-2014 activities, including some next steps for moving the project forward with partner stakeholders. Throughout 2015, more meetings will be conducted with stakeholder groups on the Connector. When completed, the Coast to Coast Connector will be a 250-mile multi-use path spanning Central Florida from St. Petersburg to Titusville. Connecting natural areas, communities, bike and walkable downtowns, and many other places. The goal is to have the C2C funded for construction by 2020. 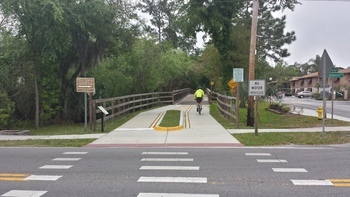 Orlando Sentinel reporter Kevin Spear recently cycled both complete and incomplete segments of the planned Coast to Coast Connector and wrote an entertaining three-part series for the paper. He began his trek at the Atlantic Ocean near Titusville on an unpaved trail right-of-way. "With only a dozen miles behind me and a long way to go, a sandy trail was swallowing the tires on my bike and making its chain sound like a coffee grinder," he began the article. Soon after the Summit, an article by Mark Howard appeared in Florida Trend magazine. "At some point within five years, knees willing, I look forward to taking a week of vacation and riding from St. Pete to Titusville," he concluded. For more information on the Coast to Coast Connector, contact OGT's Brian Ruscher (Brian.Ruscher@dep.state.fl.us).